This week, we're pausing before the fourth and final part of the build-an-eNewsletter project. Why? To get the email addresses ready. Maybe you've already done this. I scanned the 291 business cards stacked in three unsightly piles on my desk with my year-old-but-still-amazing Fujitsu ScanSnap S300. This saved space and created fuel for our outdoor firepit. 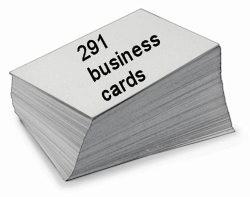 What's more, looking at 291 cards in quick succession uncovered ways make your business card better. Less generic. You'll find some overlap with an earlier post on business card etiquette. If you work in a large organization, you're probably stuck with your business card. The ideas may help your clients or business partners, though. (playing) hard to get: "by referral" or other words to imply you're too busy to take on new clients. If you truly were, why hand out cards? Google will manage your email on your own domain for free with Google Apps Standard Edition. You can get a web address for $10 US or less. With an additional 291 names, I've got oodles of potential recipients for the Marketing Reflections eNewsletter. I'll select advisors who warrant a subscription. Stay tuned. To subscribe, simply click on the button.